When will we be opening??????? My Grandad (far right) and his workers outside the main doors when the building was his engineering factory. We get asked this question so much and it's been frustrating for us trying to pin it down. As you can imagine building work on such an old place has taken longer than anticipated (and more money than expected!) We are nearly there now, fitting the kitchen soon, sorting the carpark and outdoor seating area, finishing the toilets and sorting suppliers. We HAVE to be open during August so keep your eyes peeled on facebook because as soon as we are able to open the doors and serve you we will. The website has been updated a bit with some basic menu items and we will put the wine menu on this week. It's all very exciting!! The last two weeks have seen some progress in the form of new windows and doors! We love them and think they match the feel of the building really well. This week the bi-fold doors that open up to our outdoor seating area have been installed and the light that comes into the cafe area is amazing. Roll on nicer weather and hurry up builders! We can't wait to serve coffee and food from our new place. Well some progress has been made in the last couple of weeks, the paint is eventually coming off to reveal our 145 year old brickwork! It's been a sandy/dusty process but it will be worth it I'm sure. inside we are slightly warmer due to insulation in the roof and new windows and doors are due to be fitted after Xmas. warm and toasty ceiling in our new apartment! after blasting, looking a bit orange! I've also been busy building this website and all the social sites to go with it. We will be posting our progress as the renovation gets underway so we can look back and remember what we started with. Watch this space! 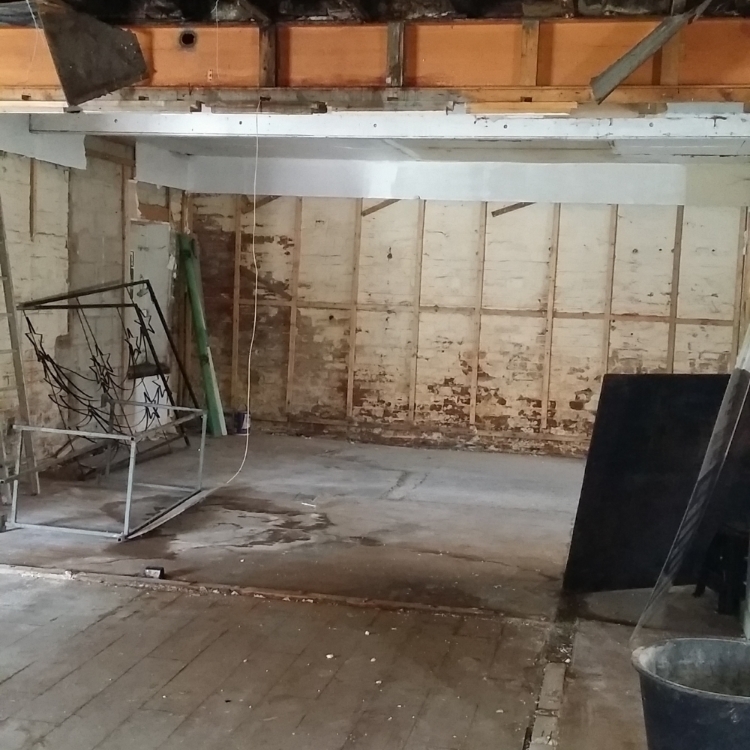 Here is the ground floor where our cafe will be, you need a good imagination to see past the muck at the moment but trust me...it will be good in the end! This is the beginning of a new chapter in our lives. Our house is up for sale and the plans for our new venture are being submitted this week. We have a lot to do before the space above looks like a professional kitchen where we can cook up some delicious food to make people happy and ultimately give us something to be proud of and happy to work at. I must admit that I am feeling in limbo at the moment while we patiently wait for the right buyer for our lovely home. We sit dreaming up menus, picturing how it will all look and feel and constantly practice cooking and baking and sharing it with our friends and family. I thought it would be good to start building our website while we wait and maybe share the progress of The Factory Kitchen as we walk the long road on the journey to be open for business.